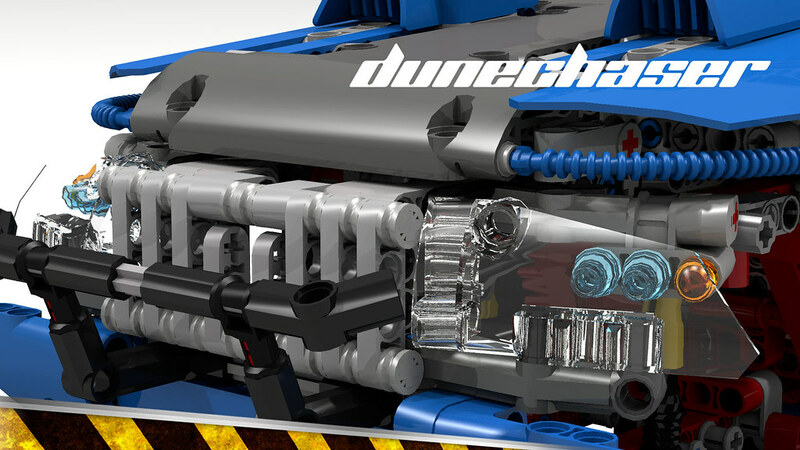 Now that the LEGO Technic 2012 Competition has finished and we got a winner, I'll start unveiling some more details about my Dunechaser [1, 2]. Today I'll show you the reason why it took me that long to submit this model into the competition. Although it got a remarkable number of supporters to which I'm really grateful. It was the 3rd most voted entry in the first phase of the competition, in less than a month, if I'm not mistaken. While thinking about building the Dunechaser I got the idea to produce the trans-clear Technic panels for the headlights, as shown in my previous renders (e.g. in the image above). I'd make use of the 3D printing technology now emerging faster than ever before, to produce them as custom made parts. However before doing it I needed to prepare a valid and accurate 3D model of the LEGO panels, suitable for printing. I've made a first attempt with a file from the LDraw library (thanks Philo for supporting me with this task) but it ended with a non-printable item as the model violated some mandatory rules required to have a printable object. LDraw models are made with a limited set of polygons and without paying too much attention to certain details, as the intent is to produced parts visually accurate that could render very fast by the CAD tools we use in our personal computers (LDD, SR3D Builder, LDraw, etc. ), rather than printable models. Hence I decided to model the whole panel myself from scratch (again my thanks to Philo for his initial hints), which ended into a complete, accurate and valid model for printing with actual technology limits (varying for different materials). Finally I paid a fortune and ordered one pair of panels, made from a transparent resin which took quite sometime to produce and deliver. Got them near the Christmas. It was during the design process, when I realized there was no way to get the panels in my hand, still within an interesting timeframe to present the model and gather enough votes. Then I decided to make my submission (on 11th Dec) and a preliminary presentation (although quite complete) of my Dunechaser model. Later when I finally received the panels, tested them and took some photos, to show you the final result and how the Dunechaser should look like, if TLG would ever produce the trans-clear panels as an exclusive item for this model (considering it would eventually get into the second phase of the competition and wins...). Click if you like to see them larger. Below also a couple of photos after having applied the panels to the model, so you can see how transparent they are, and how they could become if TLG would produce this kind of panels in trans-clear..
Hope you get as excited with the results as I was at the time. Below I've also made a video, where I show you the unboxing of my exclusive trans-clear Technic panels. Notice the red panels seen in this video were used to cause contrast and ease the model photos' blue recoloring, done at Photoshop. This is a brilliant idea. Transclear panels. I guess we will be seeing these soon in an official set. Impressive! Where did you order the 3D printed panels? I think that it would be cool to do an entire car in transclear except for all of the gears and drivtrain... Much like the "Visible Engine" model.. I've been doing tests with several foundries. These ones specifically were done at i.materialize because are the only ones I know the print with a really transparent resin. I'd love to see Lego make some trans-clear panels, although I think Lego's transparent pieces are made from a different material than their standard pieces as they seem a bit harder, and probably more brittle too. I created some renders of my Water Strider in different colours, including a trans-clear version and other trans colours. It'd be great to have these pieces in real life. If you don't mind me asking, how much did each piece cost, and how long did they take to get made? I'd say the price can be quite prohibitive if, specially if you have considerable quantities in mind. There are also some constrains, that I pretend to develop in a later post (but have quite a significant backlog dragging in between...). Although for colored parts it can be in the order of 10€ (a bit more or a bit less) per part including postage. Depends on the foundry used. Depending on the foundry it may also take between one and two weeks, from the instant you place the order until you receive your package.